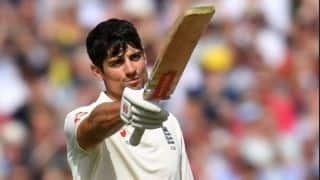 Alastair Cook became only the fifth player in the history of the game to register centuries in his debut Test and the final Test when he reached the triple-figure mark on day four of the fifth India vs England Test at the Kia Oval on Friday. Cook, who made his debut against India in 2006 in Nagpur had scored 60 and 104* in the in the match. The 33-year-old, who has announced his retirement at the end of the this series, will finish on 161 Tests – the most for an Englishman and seventh overall in the tally lead by Sachin Tendulkar (200). 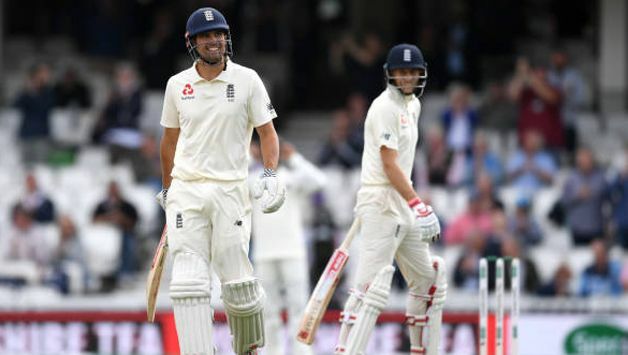 The former England captain, who has a had a terrible series, became the first opener from either side to crossed the fifty-run mark in the series in the first innings when he made 71. He reached the milestone in 139 deliveries in the second session after he was dropped on 37 by Ajinkya Rahane at slips off the bowling of Ishant Sharma. He eventually fell to Jasprit Bumrah. However, in the second dig he reached his 33rd Test hundred in 210 deliveries with five overthrows off the bowling of Ravindra Jadeja. This century takes him past Steve Waugh’s tally of 32 tons and slots him at No 10 in the list of most hundreds in a career. During the second innings he also went past Kumar Sangakkara to become the fifth highest run-getter in Tests – and the highest among left-handers. 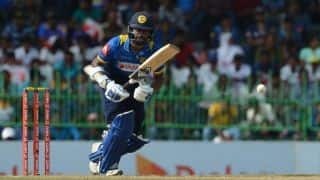 With this rare double he joins the elite list comprising Mohammad Azahruddin, Greg Chappell, Reginald Duff and William Ponsford – the four other players who have notched up centuries in their debut and last Test matches. Former Indian captain Azahruddin made his debut against England in 1984 scoring 110 in the first innings while he added 102 in the second innings of his 99th Test match, which eventually became his last, against South Africa. Australian great Chappell made his debut in the second Test of the 1970-71 Ashes series scoring 108 batting at No.7. In his last Test, his 87th, Chappell made 182 batting at No.4 against Pakistan as Australia won by ten wickets and fittingly, Chappell was adjudged the Man-of-the-match. Australia’s Ponsford made 110 in his debut Test – the opening Test of the 1924-1925 Ashes helping his team to a 193-run win. Ten years later, he hit a mammoth 266 in the first innings of his last Test once again helping Australia win the fifth Test of the 1934 Ashes, this time by a massive 562-run margin. In that innings, Ponsford was out hit-wicket. However, the first to achieve this rather uncommon feat was Australia’s Duff. Duff’s career spanned just three years during which he played 22 Test matches and incidentally has just Test hundreds to his name – that came in his first and the last Test. In the 1901-02 Ashes series Duff made 104 batting at No.9. Three years later, in the fifth Test of the 1905 Ashes, Duff scored 146, batting as an opener.